Preheat the oven to 425 degrees. 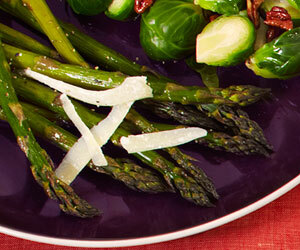 In a roasting pan, toss the asparagus with the oil, garlic, lemon zest, salt, black pepper and red pepper flakes. Roast 20 to 25 minutes, tossing occasionally, until browned. Drizzle lemon juice to taste over asparagus, then transfer to a serving dish, discarding lemon zest and garlic. Sprinkle with the Parmesan. Serve. PER SERVING: 57 cal., 4 g total fat (1 g sat. fat), 6 g carb. (3 g fiber), 3 g pro.